The vital but fraught relationship between the press and our presidents stretches back almost 250 years. In 1796, George Washington refused to seek a third term, writing that he was “disinclined to be longer buffeted in the public prints by a set of infamous scribblers.” Today, journalists seeking to write “the first draft of history” face a new set of challenges created by the 24-hour news cycle, internet, and social media. Two experienced denizens of the White House press corps will provide a rare glimpse behind the scenes in the pressure-packed White House Press Room. Nancy Benac is the Associated Press White House News Editor. She leads the team of reporters covering all aspects of the White House, one of the most competitive and closely watched beats in the world. Benac has worked for the AP for more than 35 years, covering government and politics. Major Garrett is the Chief Washington Correspondent for CBS News. 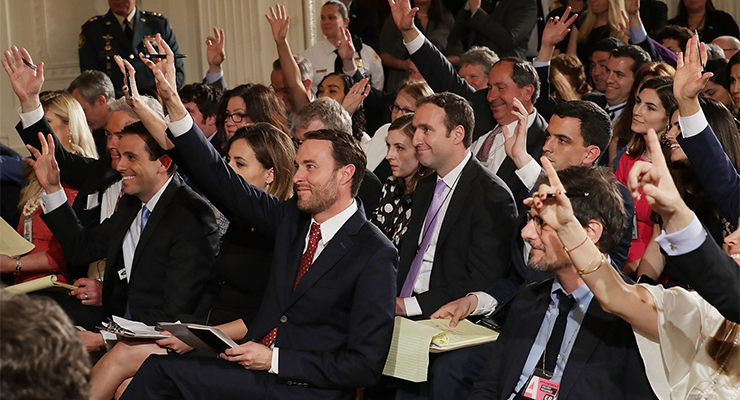 Garrett has served as Chief White House Correspondent since joining CBS News in 2012. He is a fixture on a range of CBS News’ broadcasts. Before coming to CBS, the veteran journalist was a Washington-based correspondent for CNN, Fox News and National Journal, and as a reporter and editor for U.S. News & World Report and the Washington Examiner.